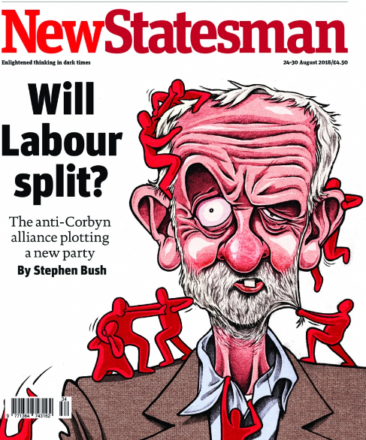 This week’s New Statesman cover, ‘Will Labour split?’, is currently making waves, as Stephen Bush predicts a split of some sort is now inevitable. It is certainly the most well-researched piece on a potential split that I have come across, and neatly sorts the different factions at play within the Corbynsceptic camp who might make or break such a project. Moving away from the question of whether this long-predicted split is really ‘inevitable’, it is clear to me that any new centrist party, particularly one formed of breakaway Labour MPs, is doomed. It hardly needs spelling out why the chance of electoral failure is high for a new centrist party; our first past the post voting system; the painful memory of Labour’s 1983 defeat and the SDP’s abject failure; the electoral collapse of the Liberal Democrats; the failure of both the ‘Green surge’ and UKIP’s 2015 popular success to translate into seats. Not to mention that the chief example of success held up by centrists is Emmanuel Macron – a man whose ascendancy was based on a presidential campaign that would be hard to replicate within British electoral cycles, and whose approval ratings continue to drop to new lows. These objections to a new party on the grounds of electoralism are well-trodden ground and, no doubt, have historically been high in all factions’ minds in trying to keep Labour’s ‘broad church’ together thus far. To understand the motivations of MPs hell-bent on splitting in the face of such dismal electoral odds, it important to understand that there are other goals in politics besides electoral success. Considering only seats in parliament, UKIP looks like a failing project with few prospects to turn things around. But filling the benches of Westminster with your people is never the whole story. Assessing their success against their stated objectives it is hard to point to a more successful political project in the last decade. They have secured a government (and to varying degrees an opposition) committed to exiting the EU, single market and customs union. They have halted David Cameron’s more socially liberal rebrand of the Tories in favour of Theresa May’s small-c conservative trajectory, and given new life to the far right both on the streets and in media. When evaluating smaller and emerging parties it can be tempting to ponder: why do they even bother under first past the post? But crucial to understanding them is that whilst they may contest elections, winning office is often only a secondary objective to a wider political aim. The dangerous lesson of UKIP has proved that it is possible for small parties to alter the narrative in public opinion and press larger parties, threatened by their potential to squeeze votes from them in marginal seats, into adopting much of their policy agenda. It is precisely this, far more than slim electoral chances, that will doom the Labour splitters. In his article, Bush writes: “One of the first questions that arises whenever a split is discussed, though, is a very simple one: is there anything that unites Corbyn’s critics, except their criticism of the Labour leader?” Unlike UKIP, unlike the SNP, unlike the Greens, these centrists have no political project, no narrative and no policy agenda to push. In every way they define themselves by what they are not. They are not supporters of Corbyn. They are not supporters of May. They are not left. They are not right. Centrists may counter that remaining within the European Union would be their political platform. I sympathise strongly with a soft Brexit agenda, but if policy change rather than electoral success is really at the heart of the splitter’s intentions, why would a reheated version of the Liberal Democrat’s pro-EU policy platform gain any more traction? The fact that no one gets what the difference would be between the Liberal Democrats and a new centrist party speaks volumes. It seems clear that the motivations behind this handful of splitter MPs has more to do with retaining political office than political influence. As Labour undergoes internal democratisation processes, including the possibility of mandatory reselection, these MPs fear that a membership-led party would offer the same hostility that they have shown the Labour movement. My message to these would-be splitters is this: if you really feel you cannot “morally” go to the country and tell them Jeremy Corbyn should be Prime Minister, no one will force you to do so. You could decide not to seek reselection to be a Labour MP, as you did just one year ago. You could even step down from office, triggering a by-election. But if you have no policy agenda to push, and you cannot articulate what you stand for without positioning yourself away from what you do not, then perhaps it is not Labour who is not for you, but politics. Rachael Ward is editor of Open Labour.